WEST LAFAYETTE, Ind. 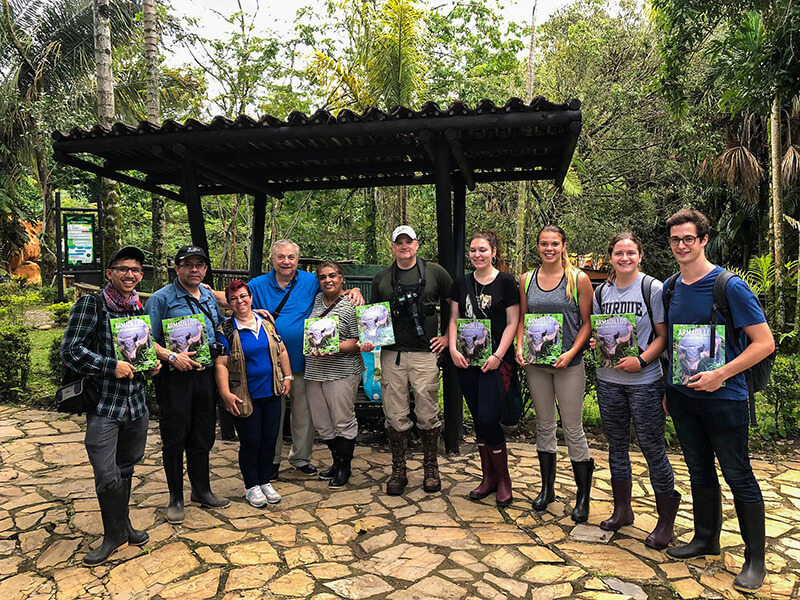 — The first ever study abroad course in biological sciences at Purdue University returned from Colombia with new insights on local culture, conservation and ecology in one of the most biodiverse regions of the world. The group, led by emeritus professor Morris Levy of the Department of Biological Sciences, research scientist Maria Levy, and professor Reuben Goforth of the Department of Forestry and Natural Resources, spent 17 days trekking from the Andean forest to marshlands on the Caribbean coast. Technically, planes were involved, but they did a lot of trekking too. The group’s first stop was a woodland restoration site near Bogotá. Next, they visited an animal rescue park called Los Ocarros, a haven for victims of illegal trading and abuse. The group helped veterinarians insert microchips in several animals, including a giant armadillo, and set up cameras to analyze animal behavior over a 48-hour period. The group visited a private cattle ranch dedicated to wildlife conservation before heading to the Universidad Jorge Tadeo Lozano (UJTL) in Santa Marta, on the northern coast of the country. This region is known for rich marine life and diverse coastal ecosystems. Ecotourism has brought significant wealth to the area, but infrastructure to support it and coal mining have destroyed the local hydrology. Many of the mangrove forests, which are among the most productive and biologically complex ecosystems on Earth, are now gone. The group took snorkeling trips to study local coral reefs and monitor fishing practices. They also participated in coral taxonomy and fish biology labs and listened to lectures by UJTL professors. Their next stop was another region threatened by mining and ecotourism: La Cienaga Grande (the big swamp) de Santa Marta. These brackish wetlands link the Caribbean to the freshwaters of the longest river in Colombia, Magdalena River. The students observed a unique amphibious human community where people rely on fish farming for survival, despite the quality of fishing being heavily compromised by the effects of tourism. Finally, they returned to Bogotá and caught a redeye back to Indianapolis. Throughout the trip, students kept journals in which they recorded their individual reflections on their experiences. Seeing the negative impact of human activities on diverse Colombian ecosystems and interacting with Colombians working hard to restore and sustain Colombia’s amazing biodiversity was inspiring and eye-opening for all of them, said Levy. Students interested in the 2019 course may contact him directly at levy0@purdue.edu for more information.